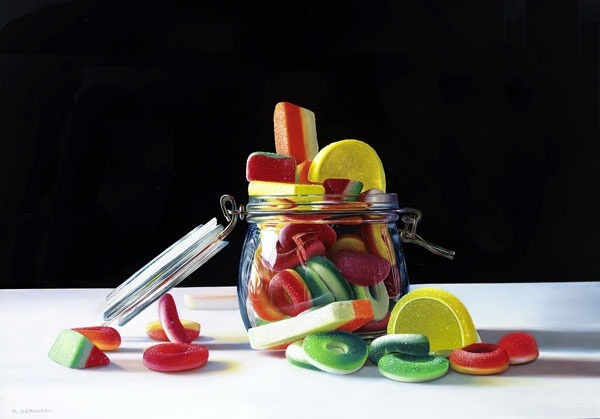 Roberto Bernardi is an Italian photorealist painter, whose still life arrangements of colorful candy and translucent glass objects reveal an astounding attention to detail and incredible craftsmanship. As mentioned in a recent Huffpost article, his intricate compositions have the ability to elevate the mundane to the fantastical. Whilst juxtaposing clutter and order, the organic and inorganic, Bernardi’s paintings comment on the technology that facilitates postmodern life. Bernardi’s paintings have been widely exhibited in numerous museum and gallery exhibitions around the world. 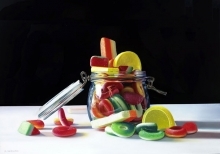 Most notably, the artist has been taking part in an international museum tour on Hyperrealism which started at the Kunsthalle Tübingen Museum in Germany and is continuing thruought 13 museum venues worldwide. So far the exhibition has been on view at the Museo Thyssen-Bornemisza, (Spain), the Birmingham Museum and Art Gallery, (England), New Orleans Museum Of Art (U.S.A.), Oklahoma City Museum Of Art (U.S.A), Museo De Bellas Artes De Bilbao (Spain), Kunsthal Museum Rotterdam (Netherlands), Tampa Museum Of Art (U.S.A.).